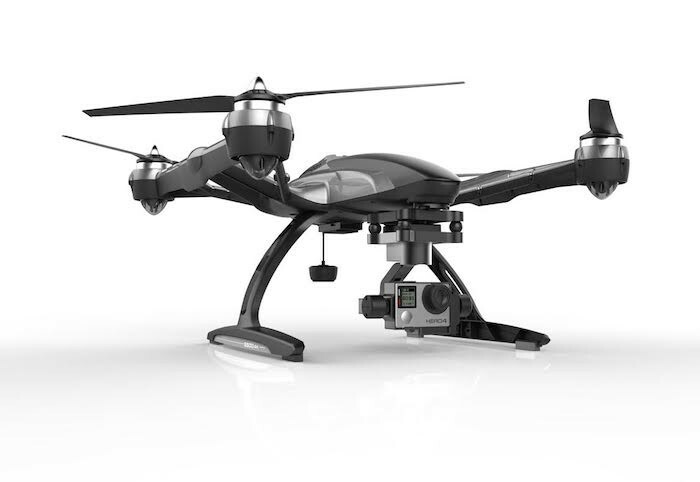 Yuneec International, the world leader in electric aviation, has announced the launch of the Typhoon G for GoPro® users. The newest member of the Typhoon family is designed to provide smooth and stable aerial footage for the crisp GoPro® camera. In addition, the Typhoon G continues to deliver Yuneec's standard of being ready, easy and safe for consumers everywhere. The Typhoon G has several smart features that ensure safety and ease of use, which consumers have come to expect from the Typhoon series. Features such as Geo-Fencing, Speed Control, Dynamic Return to Home, Follow Me and Watch Me are built into the Typhoon G system. We believe the Typhoon G will be the aerial and ground imaging solution of choice for GoPro® enthusiasts because it provides the most stable imaging available," said Tian Yu, CEO of Yuneec USA. The new GB203 3-axis self-stabilizing gimbal is designed especially for the GoPro® Hero3TM and above. It can be mounted on the Typhoon multicopter and on the SteadyGripTM ground handle - a device that ensures ground shots are as smooth as those taken from the air. While flying the Typhoon G, real-time image transmission is achieved with the included MK58 digital video downlink module and can be viewed on the ST10+ ground station. The SteadyGripTM uses up to a 6.4-inch mobile device as a display, and features camera pitch control for precise camera angle control on-the-go. Typhoon G is made for the GoPro® user, and comes ready-to-fly in a color box with a ST10+ ground station, a handheld SteadyGripTM for stable ground footage, one battery and a smart charger for the suggested retail price of $999.99 USD. For more information visit www.yuneec.com. Founded in 1999, Yuneec is the world leader in electric aviation. With hundreds of patents held, Yuneec's core technologies power manned aircraft, Typhoon and Tornado drones and its market-leading line of radio controlled aircraft for the hobby market. With offices in North America, Europe and Asia, Yuneec manufactures over one million units a year that are sold under OEM/ODM brands as well as the Typhoon brand of multicopters. The company's achievements include the introduction of the industry's first "Ready to Fly" radio controlled electric powered airplane, and the design and manufacture of market-leading radio controlled helicopters and microcopters. 0 comments on "Yuneec launches its new Typhoon G with the GB203 gimbal for GoPro HERO3, HERO3+ and HERO4 cameras"